Paramedics and emergency personnel are often the first people on an accident scene. How can we assist them in providing a secure environment to perform life-saving activities? Always be prepared, know where you are going and approach the scene carefully. Bear in mind that you may know about the incident in the road ahead but none of the vehicles around you do. Draw attention to the fact that you are slowing down and if necessary block the traffic from passing you as you approach the scene. Ensure that you are properly dressed wearing approved uniform, safety boots and a highly visible safety bib for day and night use. The type of emergency warning lights fitted on your vehicle may determine how you park or "stage" at a scene. New stream light LED light bars are mostly only visible if you are directly behind them where the older rotating lights were visible from all angles. 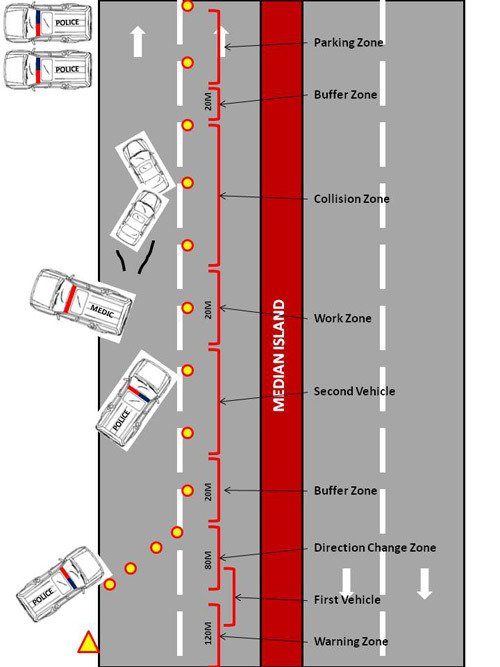 The first arriving vehicle should stop before reaching the collision scene and stage 10-20 meters back from the incident. Remember to pull up your vehicles hand brake tightly in case of a rear impact to prevent the emergency vehicle from being pushed into the scene. Emergency workers have been run over by there own vehicles because they parked too close to the scene and their vehicle was hit from behind by another motorist. Ensure that you close all doors and the boot of your vehicle as an open boot can obstruct the emergency lighting which is there to alert other motorist of a hazard in the road. Remember safety first, use your equipment to protect your vehicle and use your vehicle as a last resort impact buffer to protect you. Traffic cones and warning signs must be placed in the road to warn oncoming traffic and to direct them out of the lanes that are obstructed. On the highway, there should be approximately 150-200m of warning devices placed in the road to protect the scene safety vehicle, the distance can be less on a road with slower moving traffic. Remember that an average car travelling at 100km/h takes 70m to come to a stop on a road and that same car takes 90m to stop on a wet road. Wet roads and gravel roads mean the warning devices need to be placed over a longer distance to give the approaching traffic time to react. It is no good placing 5 traffic cones behind the bumper of a stationary emergency vehicle. Drunk or sleeping drivers may not react to emergency lighting that is why we use smaller cheaper replaceable devices in the road. If you are using a torch to warn motorists of a hazard in the road, do not blind the approaching driver by shining the light directly into their eyes, rather use a sweeping motion to catch their attention. If you blind them they may crash into you. Ambulances should stage on the "safe" side of the scene, i.e. : drive past the scene and then stop there. All other vehicles should stage between the scene and the scene safety vehicle. If you stage on the safe side, do not park the ambulances in. If necessary, do not be afraid to block a lane, this not only protects you but forces the motorists to change lanes before getting stuck at the scene. Never turn your back on traffic. Always use your vehicle to protect you and use your equipment to protect your vehicle. A dead rescuer saves no lives.